In this year's 7th Hot Air Airship World Championship in Austria, Jacques Besnard (Switzerland) successfully defended his title of world champion. Jacques' father and mentor Charles Besnard (Switzerland) moved up one notch and placed second after being third in Canada two years ago. Rainer Hasenclever (Germany), who was runner-up in Canada, placed third this year. Compared to Canada two years ago, the weather was somewhat kinder on competitors in Austria. A smaller than ever field was dominated by German pilots (5 out of 10 pilots). But the Swiss Besnard dynasty ruled over the medal ranks, all despite Besnard Senior's landing in a corn field. Rick Wallace (USA) missed the first two flights because the airship he was borrowing from first world champion (in 1988) Oscar Lindstrom had not yet arrived from Sweden. Stories of depressurized banana-shaped airships were heard and several airships had to miss one or more flights due to technical difficulties. Serious hot air airship competition is as exciting as ever! For more information, see the official championship website. I just discovered the second official web site for the 7th Hot Air Airship World Championship which is currently taking place in Austria. www.airship2000.com seems to contain more information than the site I mentioned earlier. I suggest that you go directly to the competition results page to get in on the action. A-Tech high-performance aerospace diesel engines. 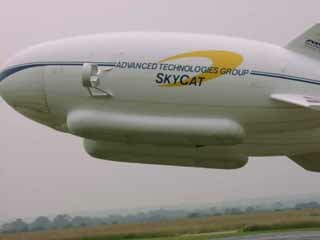 Also in late June, ATG's SkyCat prototype had its succesful maiden flight (picutred below). The radio controlled prototype, which ATG engineers affectionately call "Sky Kitten", has demonstrated excellent performance. Advanced Technologies Group has unveiled an official web site at www.airship.com which provides detailed information about all of its projects. Almost 300 delegates attended the 3rd International Airship Convention and Exhibition which was held July 1-5 in Friedrichshafen, Germany. The Convention featured over 60 papers ranging from theoretical treatises with lots of formulas to very entertaining reports about current projects including lots of pictures. 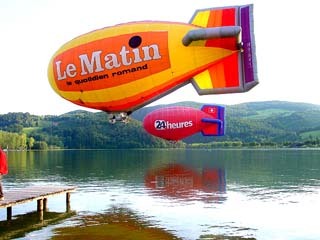 The Convention coincided with the City of Friedrichshafen's celebration of the centenary of Zeppelin airships. (The first Zeppelin airship, LZ-1, had its maiden flight on July 2, 1900.) On Sunday morning, Zeppelin Luftschifftechnik GmbH used the occasion to christen its prototype NT-07. After long talks by numerous political figures, a granddaughter of Graf Zeppelin christened the ship "City of Friedrichshafen". On Sunday afternoon, the Centenary Celebration's main event was an airship parade over Friedrichshafen harbor (pictured above). The four airships participating were the Zeppelin Luftschifftechnik NT-07 prototype, CargoLifter's recently acquired Skyship 600B, Goodyear Spirit of Europe One (a Lightship A-60+) and the Mazda Blimp (also a Lightship A-60+). More pictures of the airship parade and the Zeppelin hangar are available courtesy of Zeppelin Luftschifftechnik and Christian Michel. Due to the high number of papers this year, the papers were presented over the span of three days (Monday through Wednesday) in two concurrent sessions, mornings and afternoons. The technical papers were complemented by a vast airship exhibition which allowed all major airship companies to showcase their latest products and projects. Finally, the Convention was chosen to announce a partnership between Advanced Technologies Group and IAR S.A. Brasov in Romania to begin construction of the SkyCat 200 prototype later this year. For information regarding the sale of proceedings and more details about the Convention, please see the Airship Association's Post Convention Report. The organization committee for the 7th Hot Air Airship World Championship has unveiled an official Championship Web Site, including a competition schedule and details on the history and functioning of hot air airships. The Championship will take place September 1-10, 2000, in Bad Tatzmannsdor in the Schielleiten Region of Austria.